Now that I've introduced everyone new in primary and the primary to our 2018 theme, I'm FINALLY ready to start teaching I Am a Child of God. There was a post shared on the Chorister's FB page HERE that I really liked which incorporated the plan of salvation chart found on LDS.org HERE. I really liked the idea but wanted to keep the kids singing and and quickly answering questions about the song rather than having and in depth discussion about the plan of salvation (something that would fall under the Sharing Time umbrella). So I came up with a merger idea! I'll tell the kids that I have a puzzle that I want them to see if they can figure out what it is that coorelates to the song we are learning this month. Then I'll proceed to post one piece at a time of the plan of salvation question chart I created on the chalkboard (post pieces as indicated on the image above where it says "illustration" beginning with the white premortal life bubble/question then peach colored birth/question, etc). I'll read the question on the 1st piece of the chart then sing the correlating chorus or verse it belongs to then hang the piece on the board. Once the whole chart is hung up (the words will all be vertical but that's part of the fun! ), we've answered all the questions and sung the song several times, I'll ask them if they recognize the chart. Then I'll write "The Plan of Salvation" in chalk at the top and we can have a quick discussion about how the song I Am a Child of God is all about Heavenly Father's Plan of Happiness or The Plan of Salvation. Then bear testimony and end. If I find that Jr. primary needs movement, I may do some simple hand actions for the chorus and sing it each time we sing a verse. Next week I'll review I Am a Child of God lesson plan using the bells found HERE, more as a review. The Sr. primary will use the obbligatto bell chart and the Jr. primary will use the chorus bell chart. More to come on that. How can I say thank you enough? This is amazing and I look forward to seeing your posts every week! You are truly helping me to do the best job with this moderately overwhelming calling, and I thank you so very much for all the time and effort you put into this! It helps SO MUCH!!! So do you only use your question chart, and not the actual Plan of Salvation? I made an assumption and made both, but am now realizing that they don't seem to go together... I should have looked at the document more carefully, haha! 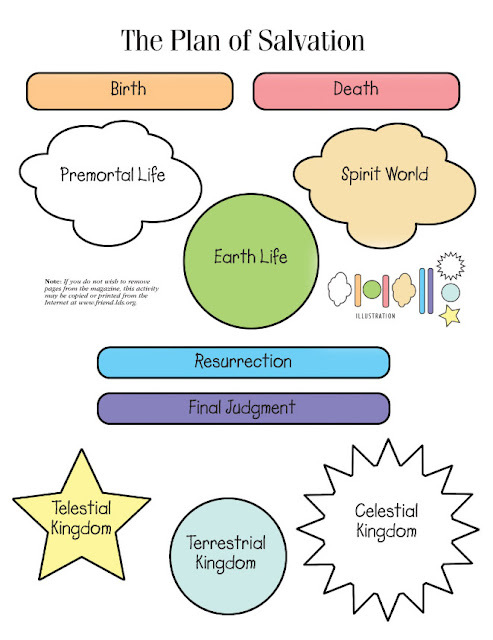 You are correct - you only use the question chart and not the actual Plan of Salvation chart from lds.org. It's only for reference and to tell you how they are to be put together. Sorry for any confusion. Just a heads-up: the terrestrial and celestial kingdoms (I think) should go with the 4th verse. Thank you so much for all your wonderful ideas and hard work! I so appreciate your site and have loved using it as the music leader. You are completely right - thank you for catching my mistake! I do that more than I care to admit ;).